An average of 8 billion chickens are sold in the United States every year, making it an extremely popular meat to throw on the smoker. And, it has made its way on nearly every barbecue restaurant menu around the nation. This is likely due to the great flavor combination when paired with BBQ seasonings and sauce. You will be slowly smoking this whole chicken at a low and slow temperature of 225-250 degrees Fahrenheit. You want to allow between 3 to 5 hours to smoke a whole chicken depending on the weight of the bird and the temperature of your smoker. You will know when your smoked chicken is done when the internal breast temperature reaches 165 degrees Fahrenheit. This recipe calls for using your favorite restaurant BBQ sauce, but if you are willing to make your own, check out our BBQ sauce recipe. Start by soaking your wood chips in water or beer for an hour to two. Apple or cherry wood is best when paired with lighter meats like poultry and soaking them prior to throwing them on the smoker allows them to smoulder and smoke instead of burn quickly. The next step is to light your charcoal smoker approximately 30 to 35 minutes before you want to start cooking the chicken. The charcoal will be ready when all of the coals turn to a glowing white hot color. Mix your BBQ seasoning with some olive oil until it turns into a paste. Take your hands and apply the paste all over the chicken. You can even separate the breast meat from the skin by sliding your finger down the top of the bird and put some seasoning directly on the breast meat. This will help add additional flavor to the meat instead of just the skin. 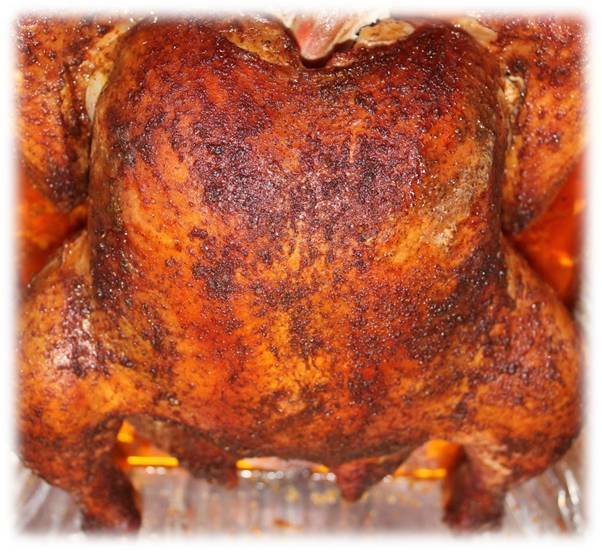 Throw your smoker wood on and place the seasoned bird on the grates of the smoker. You want to adjust the vent on top of your smoker to allow about 75% of the vent to be open. If your grill lid is adjustable, make sure the vents are positioned over the top of the chicken in order to draw all of the smoke over the chicken before it escapes the smoker. Check the barbecue chicken about once an hour to see if you are holding the right temperature. We recommend mopping the bird with the BBQ sauce about 30 minutes prior to pulling it off the smoker. This will allow the sauce to caramelize on the chicken and will further enhance the flavor. Just make sure you use a mopping brush instead of a basting brush or you will wipe away all your seasoning. Take the chicken off the smoker when it has reached an internal temperature inside the breast of 165 degrees and tent it with aluminum foil. Never cut into meat when it is hot off the smoker or the juices won't redistribute and it will turn out tough. After 20 minutes, slice and serve along side a bowl of your BBQ sauce.